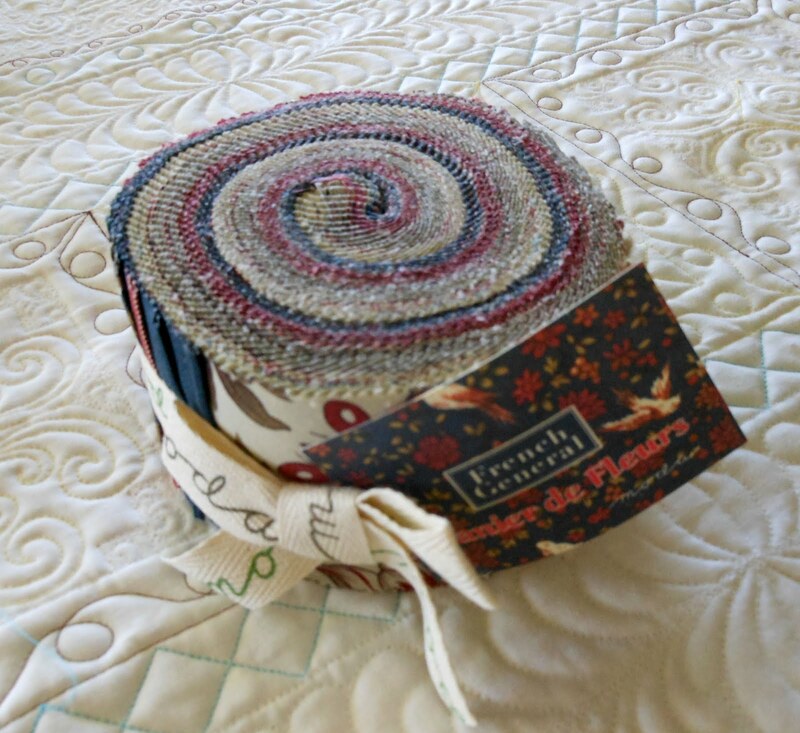 Okay - we are giving away a Fat Quarter Bundle with 38 fat quarters in it, a Jelly Roll and a Layer Cake. This is a giveaway to raise money for our charity, we will be going to Romania in 3 weeks and we have all the quilts we need, so THANK YOU to all of you who have sent in quilts for us to take. We are going to be getting school supplies for children in need (they start school a couple of days after we are there) and we will be filling up a soup kitchen with food that feeds a lot of homeless kids, and kids in need. Please know that you can enter this giveaway without donating, and you don't need to donate to win a prize, but we would like to raise money for our cause. Please know that 100% of your donations go to helping with the food and school supplies and that none of the donations go to Clint and me - we pay for our own plane tickets, food, and hotels with our own money. So, read on for the details! First thing up for grabs is a Jelly Roll called "Panier de Fleurs" by French General for Moda Fabrics. Next, a Layer Cake called "Northcote Range" by Cabbage and Roses for Moda Fabrics. And finally a Fat Quarter Bundle called "Coming Home" by Deb Strain for Moda Fabrics. Leave a comment telling us what you will make if you win. Help spread the word by blogging about our giveaway & leaving a comment telling us you did! Make a donation here of any amount and tell us you did. I have been wanting to make another quilt for Quilts For Kids from my stash, as well as one from their supplies. I did two last year and my longarm quilter donated her work. But now I've learned to quilt MYSELF! So I won't need to impose on her livihood. I would make a quilt. Original huh?! I have also just donated. I donate to Quilts for Kids and to Quilts of Valor so that is where this fabric would be going! Hmmmmm if it is the jelly roll probably a couple of weekender bags; one for me and two to give away.... the layer cake??? ?....I want to try out my new Twister rulers.... the FQ Bundle????.... something totally scrappy... yet organized... sort of like the world is (at least how I see it). Thanks for hosting this.. great idea! Posted on my blog.... thank you so much! I would also make a quilt or a table runner, depending on what I won. All are wonderful fabrics. Thanks for the chance to win. I would use the fabric to make quilts for the children's hospital with my weekly sit n sew group. On the third Thursday of each month we sew for charity. This fabric would help us. Thanks for what you and your husband are doing. I would use this in a quilt if I won. Marvelous! I would make a quilt for myself :) Thanks! If I won the fq I would make a lap/couch quilt for home and one to donate. =) Also, would you be open to me shipping school supplies your way? Let me know! I can't wait to hear stories about seeing some of those quilts you brought last year. It will be so cool! Prayers for your trip-thanks for allowing yourselves to be used! With the jelly roll I'd make a quilt using a pattern from a book I've just purchased, I'd also make a quilt with the layer cake. If it was the FQ bundle... I'd have enough to make a few small projects! How generous! I'd make a quilt for me! Thanks for the chance! Bless you for bringing all the quilts to Romania. What a lovely thing to do. I have several quilts to make for former 2nd grade students who are now going off to college. Any one of these would be put to use. Okay I just posted a donation. Loved seeing the video from last year. Can't wait to see pictures from this year's trip. I have 2 friends expecting so if I won I'd make a baby quilt. 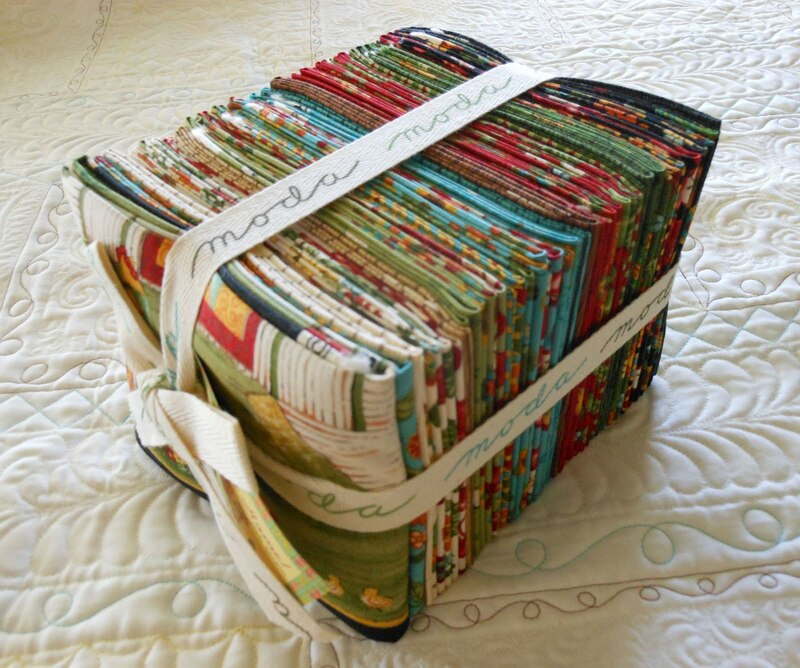 I would make a quilt for my recently widowed sister with the fat quarter bundle. What a very generous giveaway, Judi! If I won any one of these prizes, I would use it to make either a quilt or tote bags. Well, maybe I'd branch out and do a table runner. Oh I don't know, I would have to have it and look at it and feel it and let it speak to me for a while before I decided! How's that for a straight answer? Donation made...from last name Sweeney. Can't wait to hear all about this year's trip! This is such a good thing that you and Clint do. northcote layer cake I am sure because it is just so darned pretty!!! I would like to make another lap quilt for people with dementia. I have just blogged about your giveaway and i hope lots of people read it and donate. Good luck! I just made a donation in the name of Ball. Good luck - hope you get lots more. I make Quilts for Keeps which go to kids with terminal/serious illnesses and their siblings. More fabric means more quilts. Thanks for the chance. I have 2 little twin grandsons on the way, I have to make two quilts! Love the red-white-blue of Panier de Fleurs. I'd make a quilt for the American Heroes Project in Washington state. They donate quilts to wounded warriors at Madigan Army Hospital at Joint Base Lewis-McChord. The project was started by wonderful women on Vashon Island (in Puget Sound) in Washington state. Donation made - last name Hoenig. I wish I could afford more - and I hope to send a quilt to you next year. Have a safe trip and looking forward to seeing your video for this year. My donation was made under the name Pat Chubb. Just a guess, but I'm thinking any and all of those fabrics would end up in another charity quilt if they showed up at my house! I have given two quilts to H2H and wish I had time to make more. So if I won I would make a quilt and give to another charity. May you have a save trip and prayers will be going with you. I'd make a set of placemats and potholders as a housewarming gift. Thanks for the chance to win. Great colors for quilts. Since I love to quilt but you can only use so many I give to the homeless shelter and other needs in our community. If I were to win your giveaway I would use the fabric in my Dear Jane and Farmer's Wife blocks. Thanks for the opportunity. I want to donate a quilt for the Wildlife Haven Rehabilitation Centre. It would be used to raise funds at their annual "Baby Shower" fundraiser in the spring. They take care of many orphaned, injured or otherwise helpless wild animals throughout the year, with the ultimate goal of releasing them back into the wild. Blogging complete! Will see what I can do to spread the word! I'd love that layer cake. I have a pattern, Blossom by Fig Tree Quilts that it would be perfect for. I would make quilts for children and donate them to charity. I would make a quilt for the hospice my dad was in and a quilt for my gran who is turning 100 - keeping warm is a priority at that age!!!! Just donated and I'm glad I can help out. Just watched the video from last year. Would love to make a quilt to donate. If I win, I just maight make one from this fabric. I would use the fabric to make lap quilt for one of the charities that I make quilts for! Thanks! I'll teach my daughter how to sew a straight line. I can't do it, so someone may as well. If I won I would make a quilt to donate to the Down Syndrome Assoc of Middle Tennessee for the 100 Quilt for Kids Challenge and a quilt for Sarah's quilt ministry. I would make a wall quilt or a table runner. Thanks for the giveaway. I made a donation. Have a wonderful and safe trip. What wonderful fabrics! I would make another quilt for sure! Thanks for the giveaway. would all be lovely used to make things for our local charity . You always have such great giveaways and i always read your blog. I would definitely make a quilt and dream about making a handbag!!! Me too I would make a quilt! For someone who needs some shown care and love! My group is making quilts for the womens shelter. This fabric would be a blessing. Judi, you do such a wonderful thing for such wonderful children. I made a donation (PayPal Want it, need it, quilt). Glad to support your great work. I would like to win one of the gifts and make a quilt for the "Projekt Puttetæpper", a danish project, that makes quilts for children that lives away from home to learn to eat proper food and loose weight. All beautiful fabrics! Wonderful what you do regarding the charity! I would make a table runner for myself and make a quilt to give. There is a bunch of ladies from the LQS who make quilts and give to local hospitals, nursing homes, etc. and are always in need of more quilts. Thanks for the give away. I don't have a blog but I have sent an email to my local quilting group to tell everyone about the giveaway and your great site. Thanks! Have made a donation (from Elita Sharpe Mazzone). Have a safe trip! I would make a quilt ( of course) :). Specifically for my brother in law who is undergoing treatment for prostate cancer. He lives in Tillamook, Oregon but must stay away from his family while getting treatment everyday in Portland. FQ bundle. For the flowery ones - quilt for my potential new grand daughters. My son is dating a great little gal with 2 girls. None of these are really my own personal style, but they would make a beautiful charity quilt - and that is not an insult :) I am working on 5 charity quilts for a project for our church this year and plan to continue the work even when this project is complete. It would be nice to have some pretty more up-to-date and coordinating fabric (like any of these above) for our charity quilts. Love what you are doing - such a great cause! I think I would make a tote. I need a new school bag. I might make a quilt for my mother in law or maybe one for my own bed. Well, I always threaten my husband to make him quilted boxers. Or a set of matching quilted jackets to wear when he comes to the quilt show. Blog post up....8/16/11...so incredibly honored to share with my readers your amazing willingness and personal sacrifices as you both head to Romania...again. What would I make...oh geez...I always struggle with those. How about a quilt...could I get any more generic than that? What would I make? First I would keep it out so I could admire it, and feel the texture. Then I would make a quilt - I like wall quilts and small quilts, so I would take the layer cake and make some small quilts for my small quilt wall. I am in Christmas gift mode. Any of these prizes would be a welcome addition to my gift making. I blogged about your mission trip. You guys are amazing! I would make a quilt for my new grandaughter. What would I make? I'd probably go ahead and make another donation quilt for this wonderful cause! My quilt guild has supported a local shelter for women & children. I would love to make a quilt or two to support this cause. Thanks for all you have done for the Romanian children! Awesome, I would make a quilt for my Mother-In-Law, we have had a rough year as a family and she could use the pick-me up!! 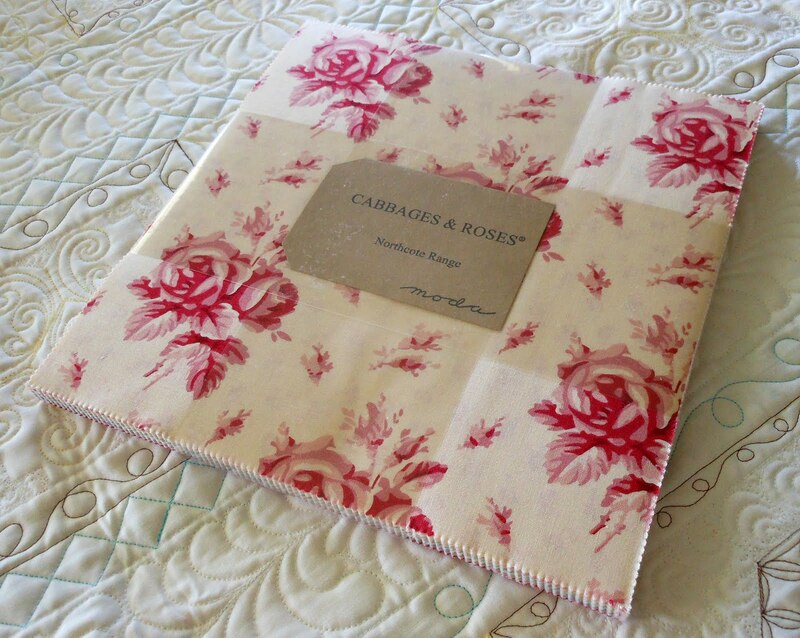 If I won the Cabbage and Roses, I'd make something for my sewing room, but with either of the others, I'd make a charity quilt to share the goodness. There is a layer cake pattern I have been wanting to tackle for almost a year now! But I have a book of jelly roll patterns and two books of fat quarter patterns, so really, anything goes! Just watched your video over at IHAN. So touching. Seems fitting that a charity quilt be made from these fabrics. Blessings to you. I would definitely make a quilt with any of the precut pieces. I love using them in quilts. Your work that you do in Romania must be difficult and yet so fulfilling. You are both a blessing in their lives. I homeschool my daughters and we would use these to learn more about quilting and to make a quilt. I've recently made quilts for Japan and Joplin. I would love to make a couple of quilts for your next trip. I would make another quilt, this one for your 2012 trip! I can't wait to see the video of this year - I would love to see my H2H quilt being handed to someone! Such a blessing! I would have to make a quilt for one of my patients. I am a home health aide and give a lot of quilts to the elderly to use. They love them! I blogged about your giveaway (added to my post) and also put your button on my sidebar with a note about the fundraiser! Hope it helps! Here is my second entry because I blogged about your efforts! I happily made a donation! Thanks for the chance to win! This is my second entry for my donation. Thanks for the chance to win, and to help with this ministry! This is my third entry for my donation. Thanks for letting us help in this ministry! I love the layer cake. I have been dreaming about a simple log cabin lap quilt. Have fun in Romania. I would make a quilt for charity! I hope you have a wonderful trip! I'D MAKE A NEW QUILT! I just got some new books for pre-cuts and for fat quarters so I would make something out of those. I would make a quilt...I'm getting in the mood for another one. Passed the word on to friends/family. I would like to make a quilt for my mother-in-law. I work but make handcrafted things in my free time to sell at school fairs to raise money for disabled children on the tiny island of Kiribati. I'd use any prize to make more stuff for these kids! Excellent give-a-way, any charity that helps kids directly is doing excellent work. Well done! thank you for the opportunity to win this fabric. The work you do in Romania is very inspiring and I admire you for doing it. If I were to win anything I would make a quilt from the fabric and donate it to your cause for your trip next year! I would make and donate to next years trip to Romania. You inspire in so many ways. Since, I always make my charitable donation first, tiny art quilts for the Alzhemeimer's Art Quilt Initiative would be first on my list, then if I had some left, a bag to use when I visit the quilt show! I would make a wall hanging for my living room...the fabric matches!! Those are so cute! I would make a quilt for my littles! I would make one of those 10 minute quilt block quilts that you fold and has 3 seams. I saw a video where she used jelly rolls and layer cakes and cut rectangles. I get to order these books later on, was going to now but have to make a trip to see my in-laws cause she's in the hospital. I didn't know about your trips/quilts until I read IHAN'S blog post. If I win one of these, I'll make a quilt for one of the kids for your next trip. It's wonderful to hear you have enough quilts to take with you again! I think your charity is fantastic! If I win, I'll be using the fabric to make another quilt for you to take next year! first thing, I will undo the beautiful packaging, and unfold the folded or unroll the rolled or unstack the stacked. Then I will enjoy all the colors & designs. Maybe I will sort them out into lights & mediums & darks. Eventually, they will tell me what to make. I made a little donation to your wonderful cause. This is a fantastic giveaway. If I´m the winner I would make a kingsize quilt for my bed. I'm sure it would be a quilt. Good luck with your funraiser. It is such a great cause. Thank you for your generosity. I would love to make my first even quilt using these fabrics and I would love to sew this quilt for my 5 month old daughter. What big hearts you have! Of course I immediately made a donation... happy to help you make a change for the better. Thank YOU. As for your question - I have a nine patch quilt that would look lovely with those fat quarters - my mom has been searching for a jelly roll for a project and there's always a great bag pattern that needs charms, right? Fun! 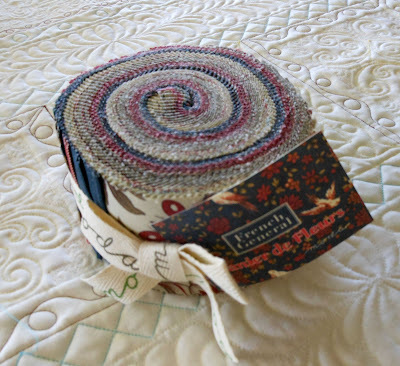 With the Jelly Roll, I would pick 2 designs to make from Pam and Nicky Lintott's book "Two From One Jelly Roll Quilts." There are some great recipes on the Moda Bakeshop Blog for layer cakes. With all of those fat quarters, the sky is the limit. There are lots of things that can be done with them. Most of my quilts are made as donations to children's charities, maybe with the fat quarters I'll make a quilt just for me. If I win I would love to make a quilt with such pretty fabric. I would donate whatever I would make. Your charity would be the recipient. A prize like this would give me inspiration to sew once again as I have been away from the machine for about a year. I would make a quilt for our cause. Our small quilt group members make quilts for foster kids in our county. We are self funded. With me being unemployed I cannot participate as before. I just sent an email to my small quilt group members to come visit your blog. What a wonderful cause. THanks for taking the time and money to help others like this. I've blogged about your giveaway. I would love to win the fabrics, especially the fat quarter bundle 'coming home'. I want to make some baby quilts for a friend at work having a child, and her family lives far around the world. I wish you great success with the fund raiser and will try and make a donation. If I won any of these - but especially the fat quarter bundle - I'd use it to make donation quilts for Slave Lake, Alberta where 700 homes burned earlier this summer. I'm sure I would make a quilt, but don't have a clue what pattern I would use yet. I think I have at least 5-6 in the works already, so thinking of another project is beyond my brain power right now - lol. I's be very happy to make a quilt. Then find some-one to bless with it. ive got dolls quilts and fabric bunting on the brain lately...so id have some fun with any of these prizes! good luck and blessings on your wonderful trip! It is so hard to tell what I will make but there is little doubt it will be a quilt. Maybe another one to send to you. I would make a quilt with the fabric and donate it. Great giveaway! Besides quilts, I've been making totes and duffle bags this summer. Thanks so much! I would use the layer cake to make more hexi's to add to my quilt. Bless you for what you do. Donation has been made. One thing I would like to make is a weekender tote bag. Thanks for the giveaway and safe travels. I would make a quilt for my best friend. I'm a Moda addict and have become a big fan of quilts using pre-cuts. I love your site. I have made my donation. Bless you for helping these children! I will make a quilt(s) - and skirt/dress for the grandnieces. Money is in short supply for me - will pray for your safe and successful trip just as did when Clint went last year. I would use the French General jelly roll to cut more hexagons. If I was to win any of the sets that are being away, I would make a quilt to be given to the child our church sponsors. Her name is "heather". Christmas is coming all too quickly and my supplies are terribly short. Thanks!! If I won any of these great give aways, I would make a quilt and donate to a local hospice in memory of a dear quilting friend who recently passed away. Thanks for the opportunity. I think I'd make some pretty gifts like table toppers or small quilts to share. I'd love to win this to make some cute little doll quilts! Congrats on your trip to Romania. Looks like it would make a nice lap quilt. Or a lap throw for a dear friend....to have a Special HUG with her all the time. If I were to win, I'd turn the fabric into hexie flowers both for swaps and for my Granny's Flower Garden. I would love to start a new quilt (for me!) with the Coming Home bundle. Thanks so much. Thanks for the chance to win. I would definitely make a quilt for someone else. Making quilts for others is the best way to honor them. this is my 2nd entry for blogging ! just made a donation so you can keep up your FABULOUS MISSION WORK !!! God bless you all ! Please tell me I'm not 'cheating' !!! Oh my goodness, I love the Northcote Range fabric. I have the perfect pattern for a "shabby chic" quilt for my niece! I would make a quilt for me or my project linus chapter, not sure yet.